Soliciting multiple people’s opinions simultaneously can be chaotic. Verbal feedback is often ambiguous and can be misinterpreted. People disagree and might counter-argue and talk over each other. The person tasked with recording feedback can get distracted and forget to write something down. The result is that you often are left with little clarity or accountability. If your team members usually complete their review individually in twenty minutes, then having five people review a piece of content will take an hour. But if you have those same five team members in a review meeting, then they have to give their feedback and also listen to and discuss the other reviewers’ feedback. Now your five team members have spent an hour each on the review instead of twenty minutes. Often, this is an unnecessary and inefficient use of time. The subjectivity of most reviews make them difficult to perform in a group setting. 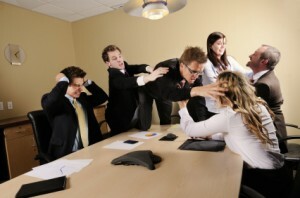 In a meeting, some people’s opinions can drown out the opinions of others. Or the first feedback presented may bias other reviewers before they are even able to form their own opinion. This is the third in a 3-part series taking a closer look at the issue with the status quo, and why a Creative Production Management solution is essential to an efficiently functioning marketing or media department.